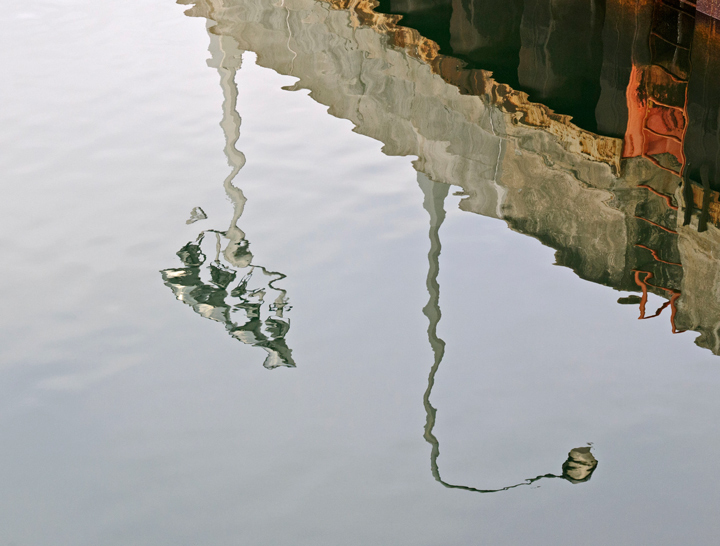 Recent reflection photos take on a walk through Canal Park in Duluth, Minnesota. 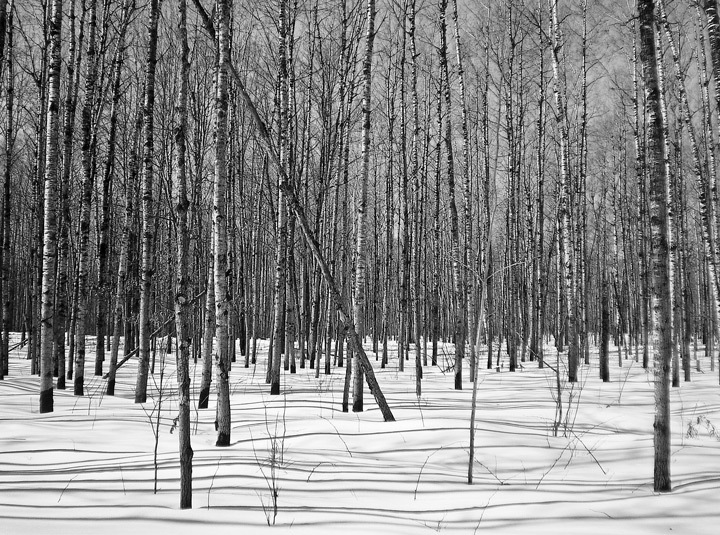 The last week of winter we drove over to Amnicon Falls State Park to check on late winter conditions at the park. There had been a 6 inch snowfall overnight and we were the first ones to arrive at the park that morning. The sun was not out yet although it was trying to peak through the clouds. The last couple of weeks of March I’ve had a chance to visit Canal Park Several times. The last vestiges of winter are still around but spring is not far away. When we woke up yesterday morning it was 0 degrees and a beautiful sunny morning. 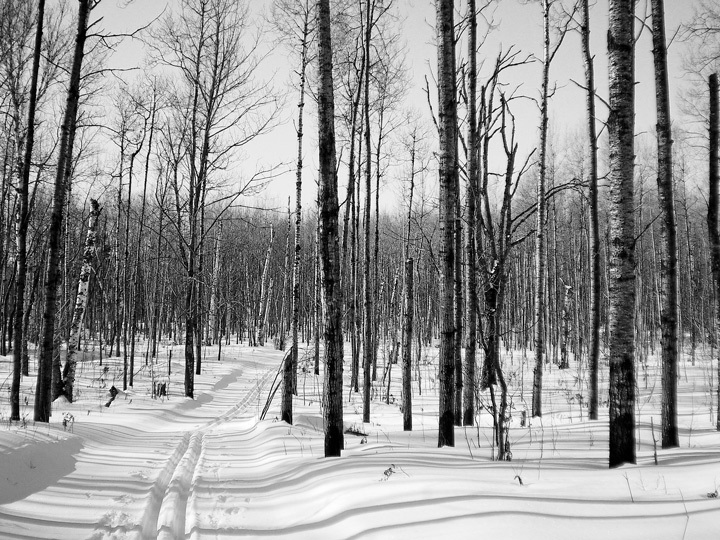 We decided to head over to the After Hours Ski Trail in Brule, Wisconsin. When we arrived we were the only car in the parking lot. We knew it was cold when we stepped out of the car and the snow crunched under our feet. The skate lanes had been groomed on Saturday after nice 5 inched snowfall. 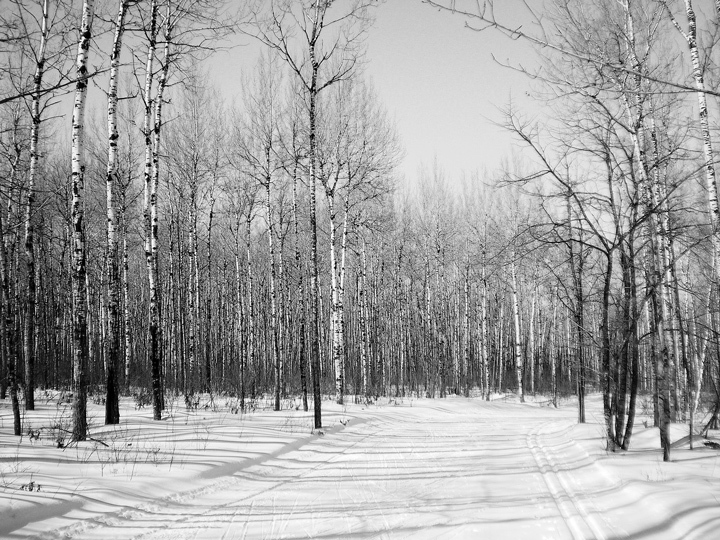 The classic tracks had not been groomed but they had been skied in and they were fine. We skied for over three hours on a beautiful day with some of the best skiing we have had this winter. It is great to be skiing this late in March. 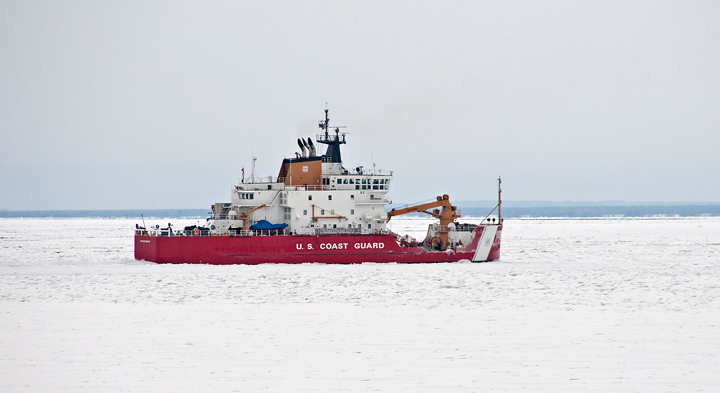 In an earlier blog I mentioned that the ice breakers were working to clear the shipping lanes in Duluth, Minnesota. 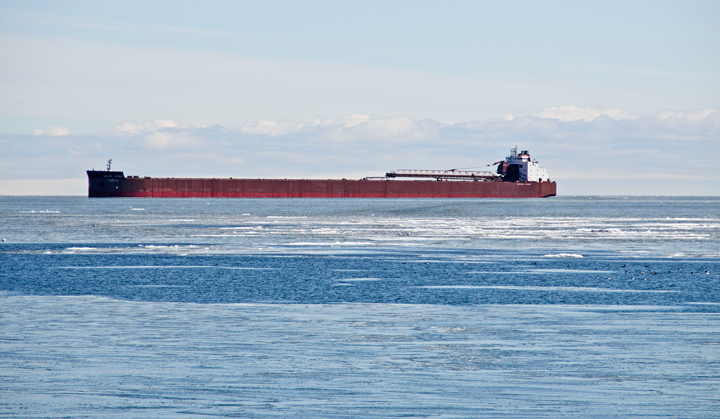 This past week the shipping season opened when the Mesabi Miner departed Duluth to deliver a load of coal to Marquette, Michigan. It was also scheduled to be the first arrival when it returned from Marquette. 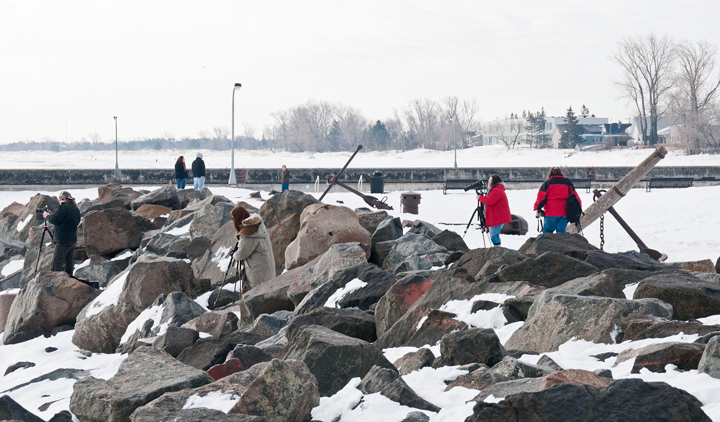 On Saturday I went down to Canal Park to watch the Mesabi Miner return to Duluth. As I was nearing the harbor entrance I notice a ship leaving the harbor. 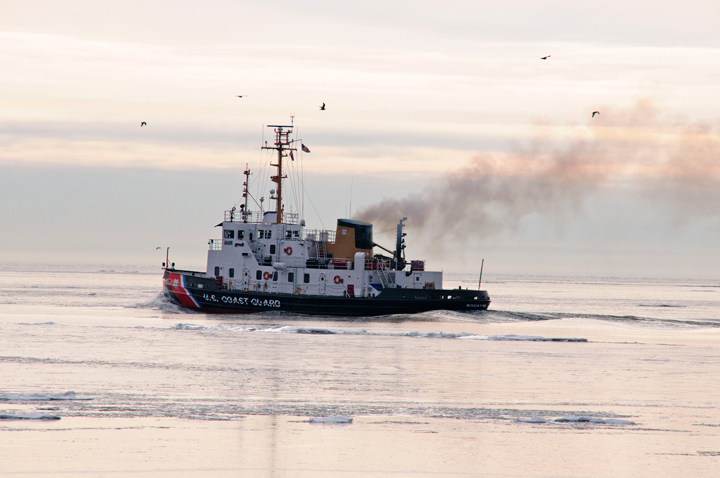 It was the Biscayne Bay a Coast Guard Icebreaking Tug. It was heading out into Lake Superior to break up the ice outside the harbor. 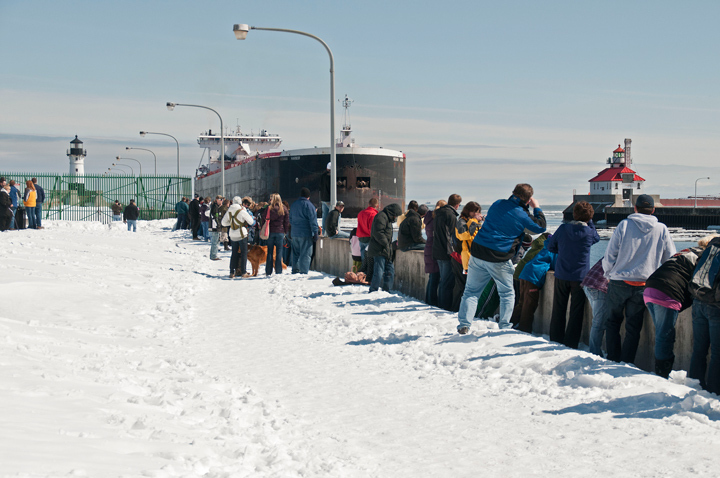 When I arrived at the shipping Canal there was a small crowd on hand to welcome the Mesabi Miner into port including about a half dozen photographers. 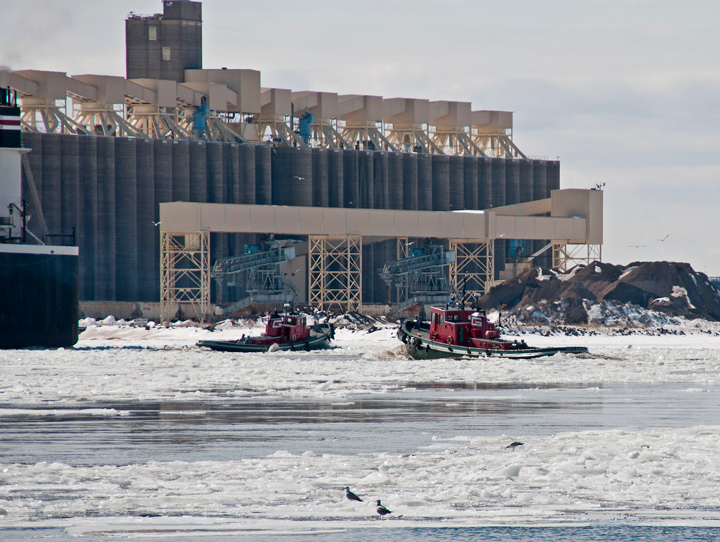 As I watched the Miner steam toward the harbor I thought a jet was going overhead but the sound was coming from the ice breaking as the Mesabi Miner approached the harbor. As the Mesabi Miner neared the harbor entrance a murmur went through the crowd. Someone said she was going to the Superior entrance to the harbor. Everyone ran for their car to drive over to the Superior entrance. That is everyone but me, since I walked down to the harbor. I kept looking at the AIS tracking on my phone and it clearly showed that the Miner was going to enter through the Duluth entrance. It turns out it had headed toward Superior because it was going to anchor outside the harbor and it needed to clear the shipping lanes. The Rodger Blough was still at the docks so it had to wait for the Blough to exit the docks before it could enter the harbor. 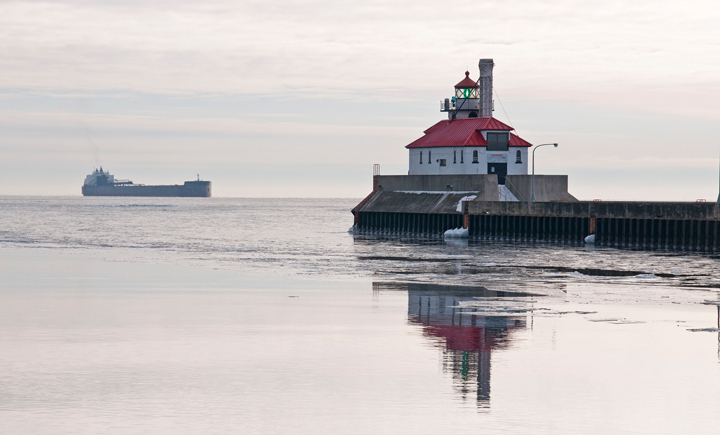 Later in the morning the Indiana Harbor left its winter layup in Superior and exited the Superior entrance to the harbor. It made a wide circle and became the first ship to enter the Duluth Harbor because the Mesabi Miner was still waiting for a slip to free up. Since it was around noon there was a large crowd on hand to watch the Indiana Harbor enter the shipping canal. 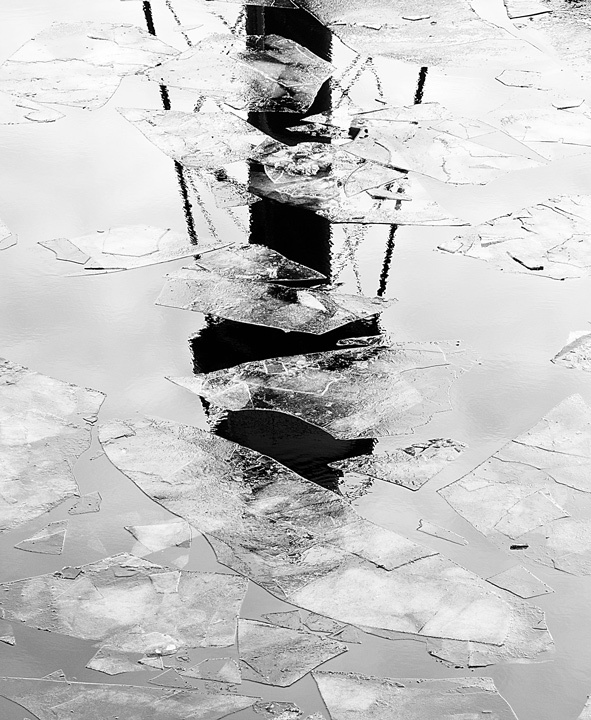 After entering the harbor it was met by several tugboats that were breaking ice near the refueling station. 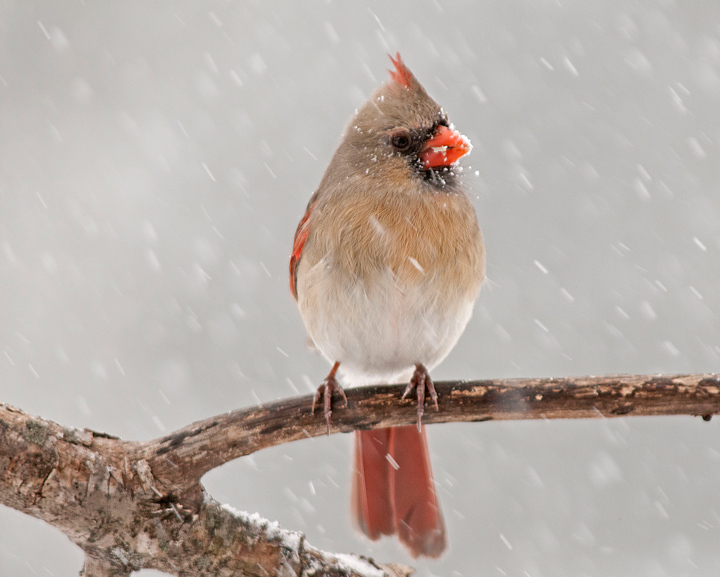 This has been a great winter for bird photography. I’ve been able to photograph several birds that I’ve never seen at my feeders and I’ve had a several species that have shown up in unusually large numbers. In contrast to last year when we had little snow this year we have had a lot of snow. 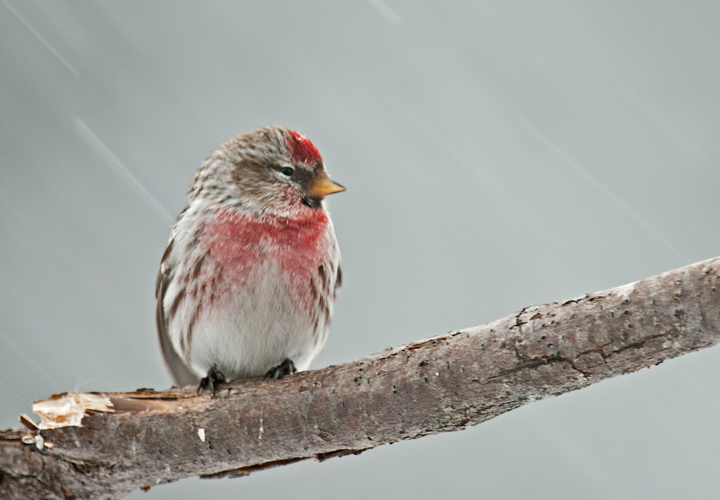 More importantly it has snowed during the day when I can photograph birds. 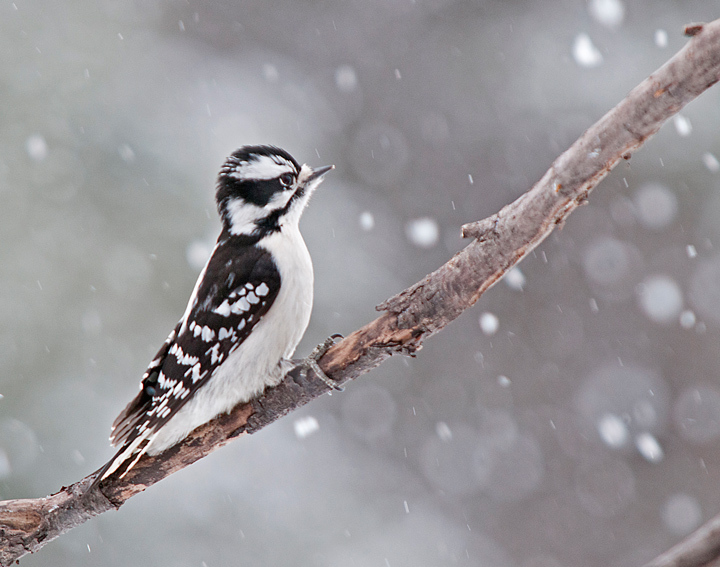 I live for photographing birds in snow storms. 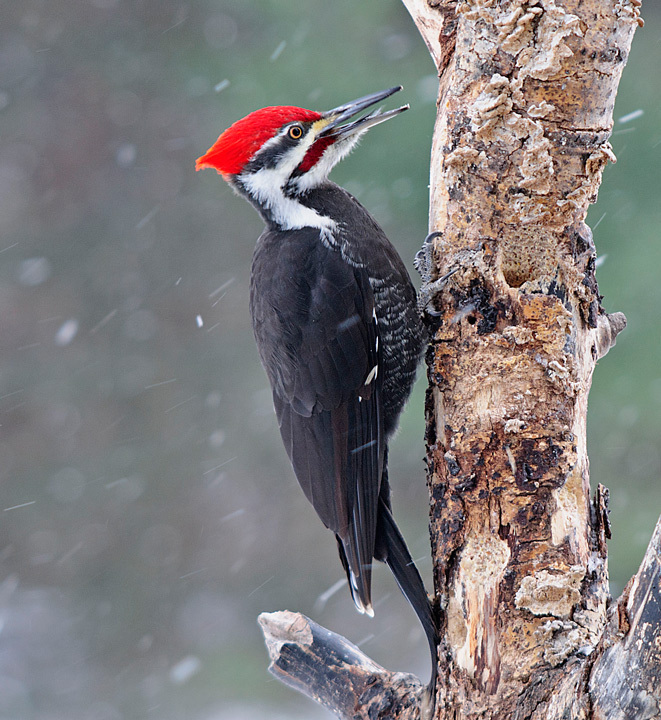 Pileated Woodpecker – This year, for the first time, a Pileated Woodpecker has shown up at my feeder on a fairly regular basis. In the past I’ve seen them around the farm but they just flew past my feeders. This year I tried a new suet feeder and that has attracted a male Pileated. He is still a shy bird so I’ve only been lucky enough to photograph him a few times. He is a spectacular sight when he lands on the feeder and starts banging away. The down side is he does considerably damage to my suet feeder. 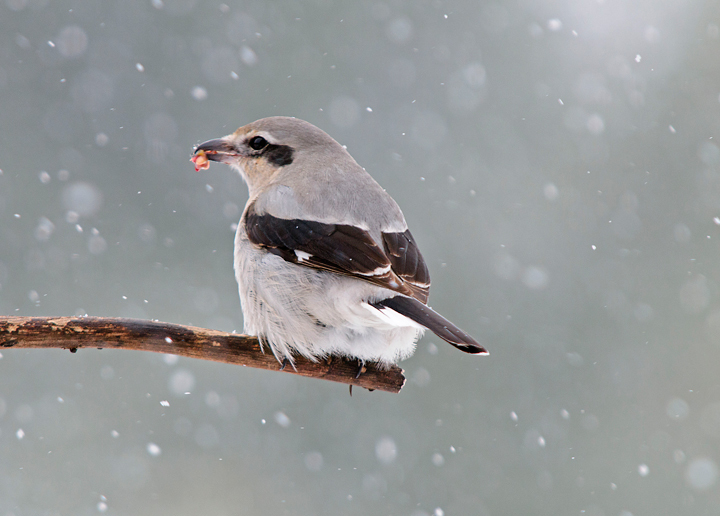 Northern Shrike – This is also the first time I’ve seen this bird at my feeder. Of course he is feeding on other birds usually the Black-capped Chickadees that frequent my feeders. I’ve only seen it a couple of time but still was lucky enough to get a few photos. 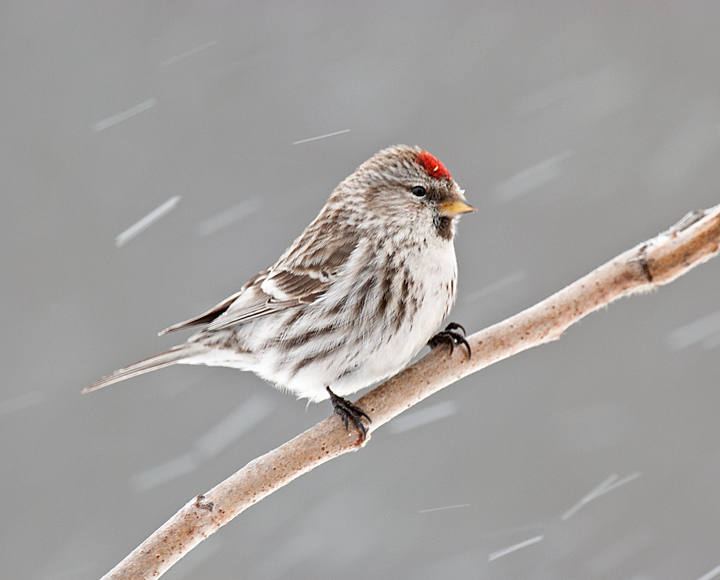 Common Redpolls – This bird showed up at my feeders in small numbers early in the winter. Around the end of February they showed up in large numbers. 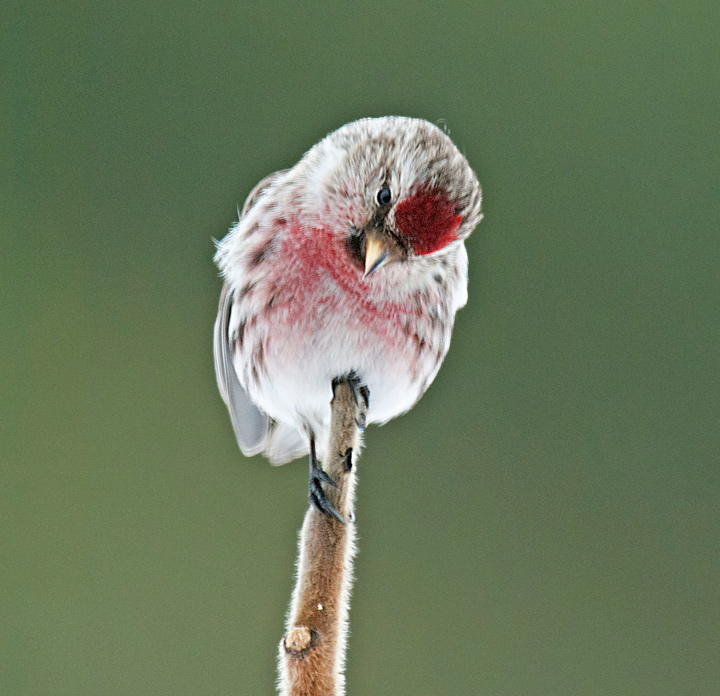 I had my thistle feeder out all winter and up and until the redpolls showed up I hadn’t had to change the thistle seed even once. One morning I woke up and found the thistle feeder filled with them. After a couple of weeks they were around in reduced numbers. 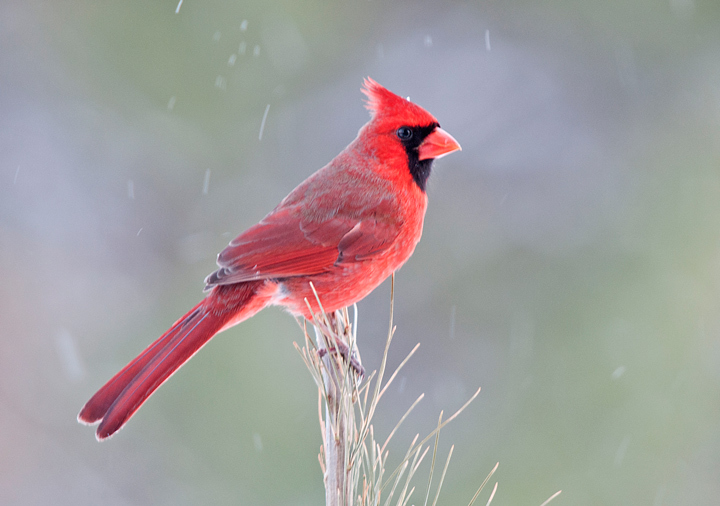 Northern Cardinals – I have Northern Cardinals at my feeder year around but this winter I’ve had an unusual number of them at my feeder. 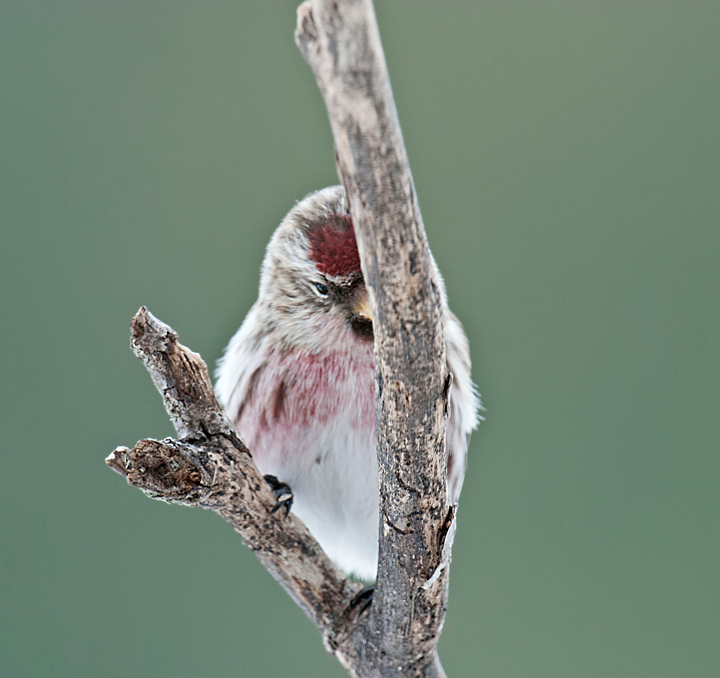 It has not been uncommon to see a dozen of them at the feeder at any one time. They really love my new suet feeder probably because I’m using peanut suet with nuts in it. The new feeder has plenty of places for them to perch so they can get at the suet. 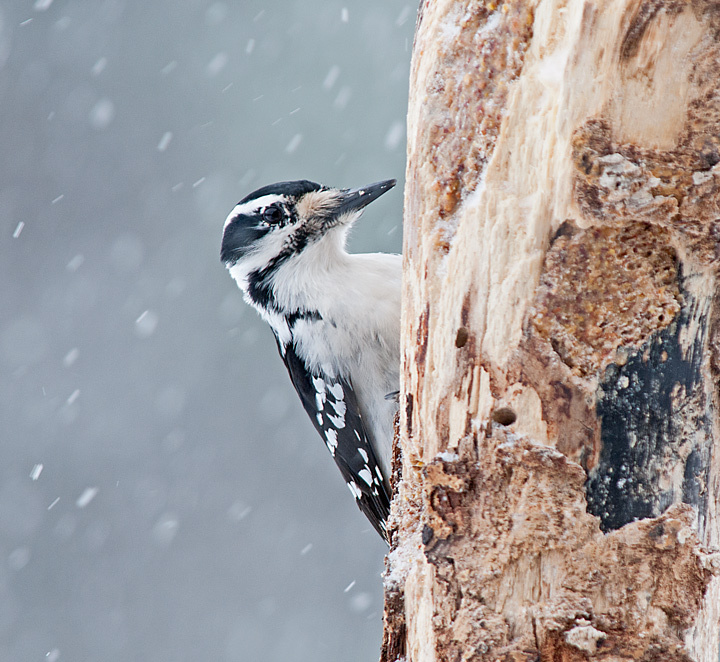 Downy Woodpeckers – They frequent my feeders year around but seem to be most active in the winter time. It is not unusual to have a half dozen of them at my feeders at any one time. They feed on both the peanut and regular suet feeders. 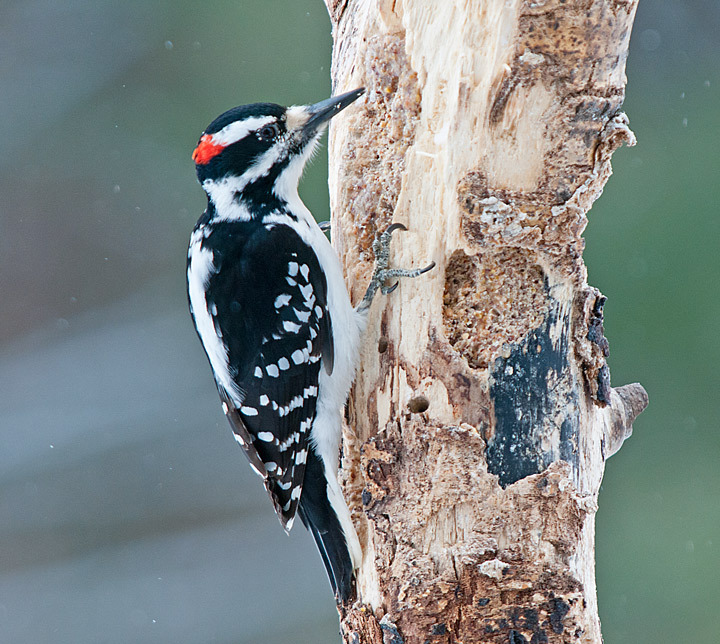 Hairy Woodpecker – Larger than the Downy Woodpecker the Hairy Woodpecker is seen less often around the feeder. I rarely see the female and male at the feeder at the same time. 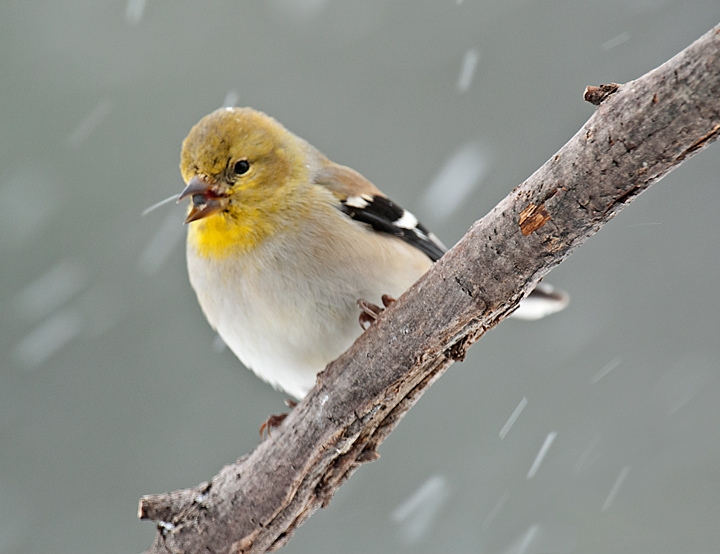 American Goldfinch – Again they are here year around. They have appeared somewhat sporadically at my feeders. Generally there are some of them around but they were gone for a couple of weeks and on the day the Common Redpolls showed up at my feeders in large numbers the American Goldfinches also returned to the feeders in large numbers. 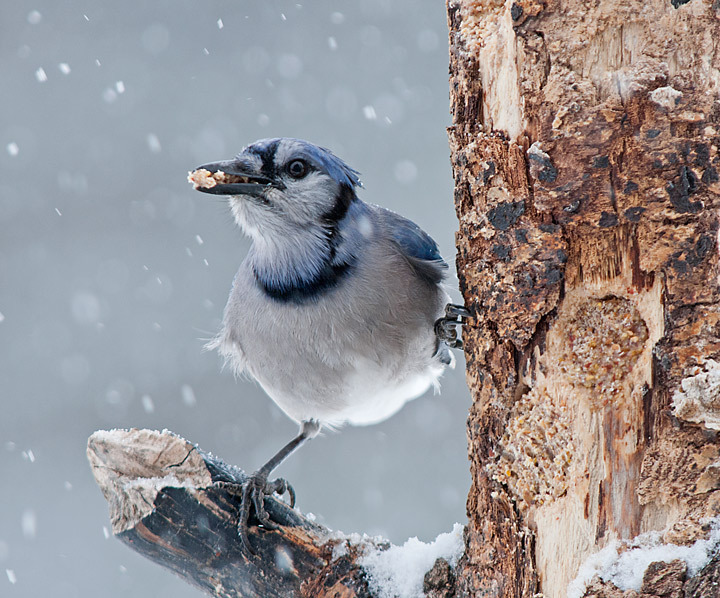 Blue Jay – Blue Jays are frequent visitors to my feeders but they usually stay in the shrubs at the base of the feeder. They seem to be fairly skittish so any movement and they are gone. 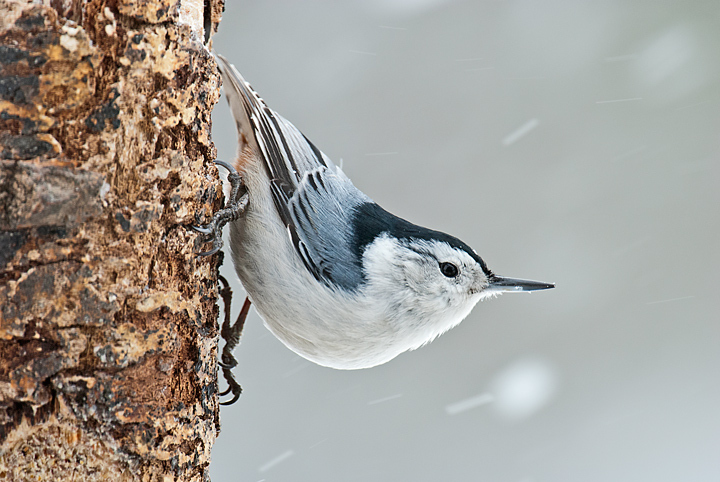 The only times I’ve been able to get some shots is when it is snowing out and they are at the suet feeder. 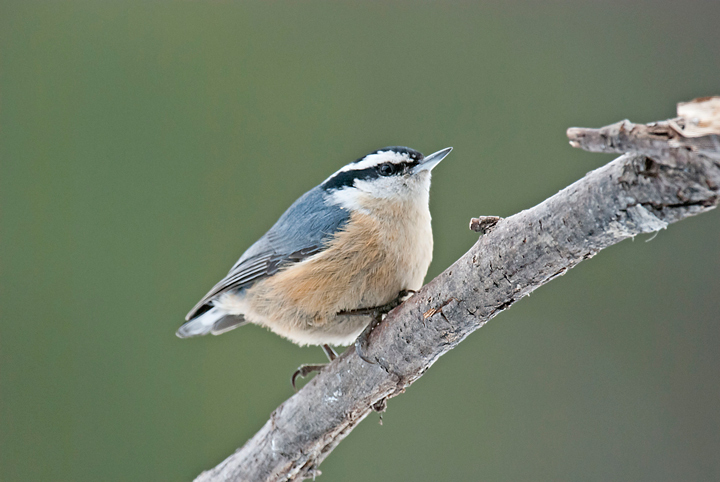 White-breasted Nuthatch – White-breasted Nuthatches show up at my feeders every three or four years. This is the first time they have been at the feeder since 2009. They have been around all winter this year. Red-bellied Woodpecker – The Red-bellied Woodpecker also shows up at my feeders every three or four years. They have also been around all winter. This is the first year both the White-breasted and Red-breasted Nuthatches have been around the feeder at the same time. 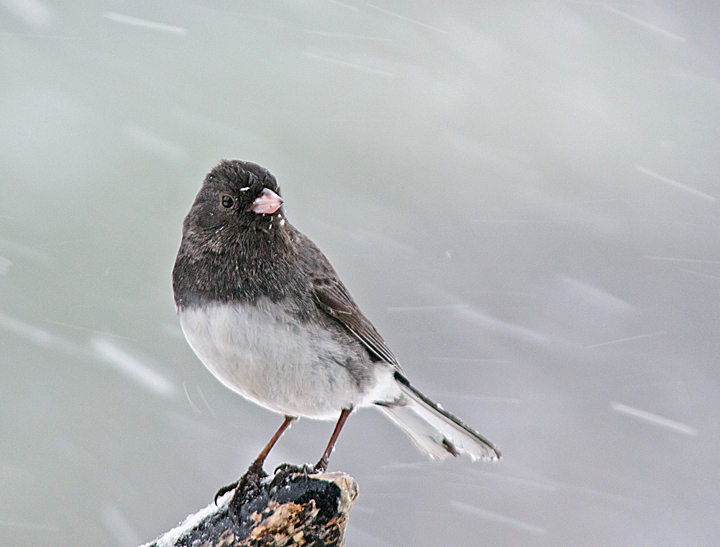 Dark-eyed Junco – Is one of the first winter birds to turn up at my feeders. They have been around in large numbers this winter. 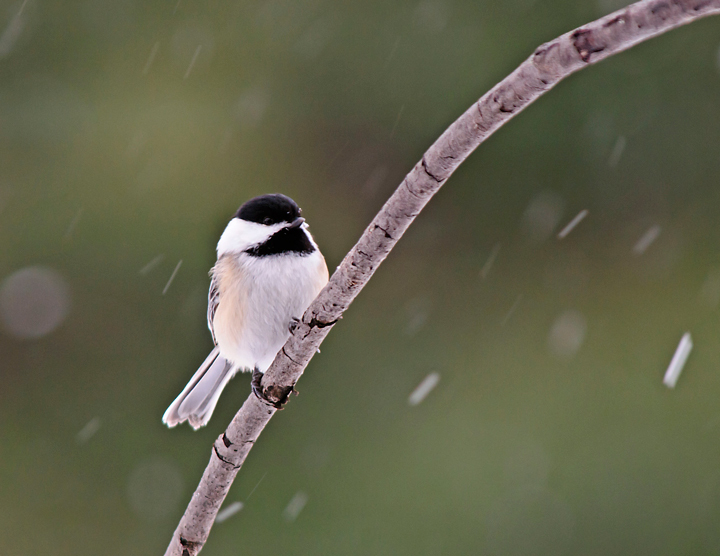 Black-capped Chickadee – I have more Black-capped Chickadees at my feeder than any other bird or at least it seems like there are more of them. Since they are in constant motion it seems like there are a lot of them going to and from the feeder. 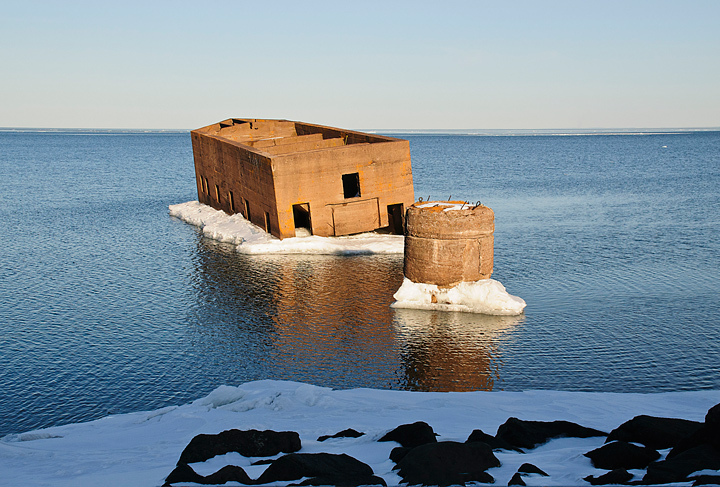 We happened to be in Duluth, Minnesota over the weekend when we notice a ship out on Lake Superior. 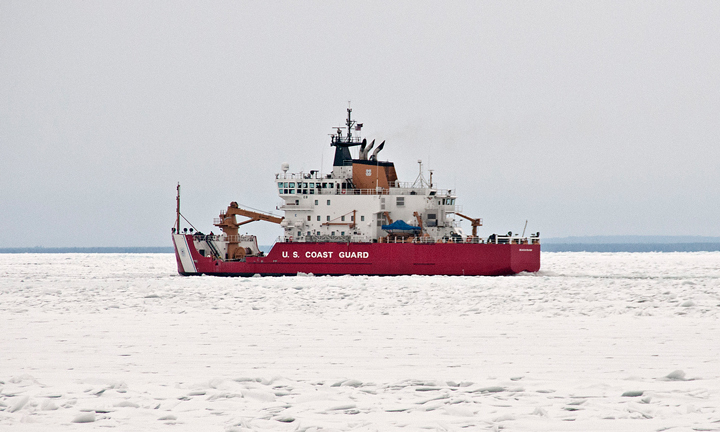 Turns out it was the U.S. Coast Guard ice breaker Mackinaw. 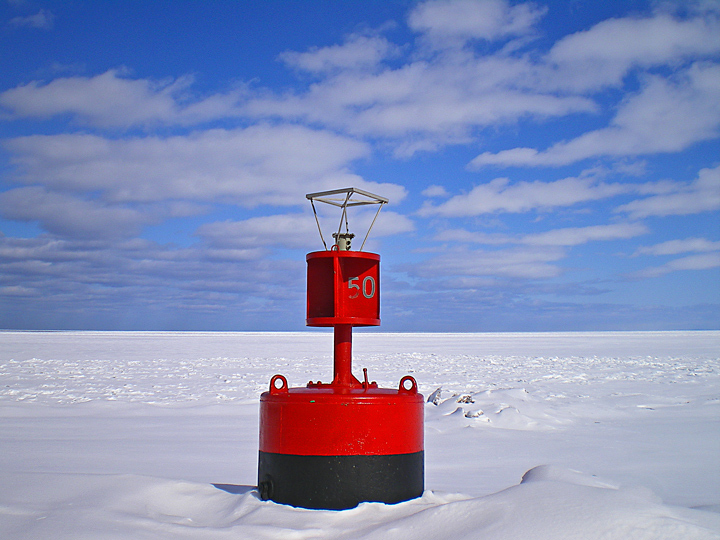 The Mackinaw is the largest ice breaker on the great lakes. It has a unique propulsion system with two aft-mounted azipods, and one bow thruster.. It has 10 officers and a crew of 46. They have been in the Twin Ports for the past several days breaking ice in the harbor and between Duluth and Two Harbors. 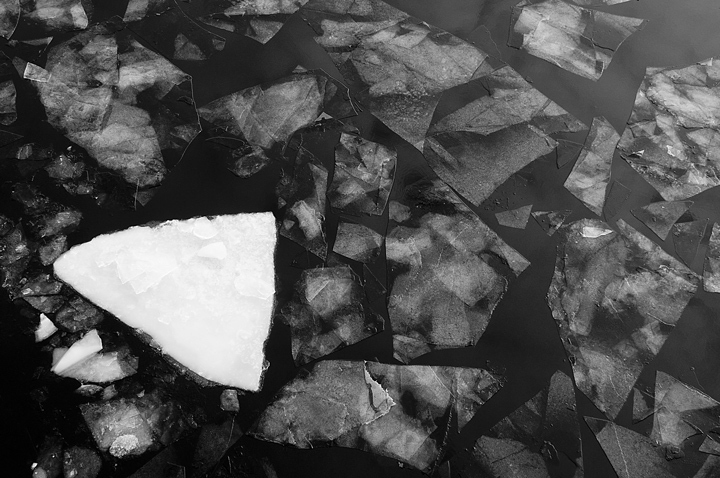 The goal was to break the ice up so the wind could push it out into the lake. When we first saw it coming toward Duluth we thought it was going to head into the harbor but as we walked toward the harbor we noticed it stop and do a 180 degree turn and head back out toward Two Harbors. It continued to make trips back and forth for the rest of the day. It’s job finished in Duluth it headed for Whitefish Bay on Sunday. 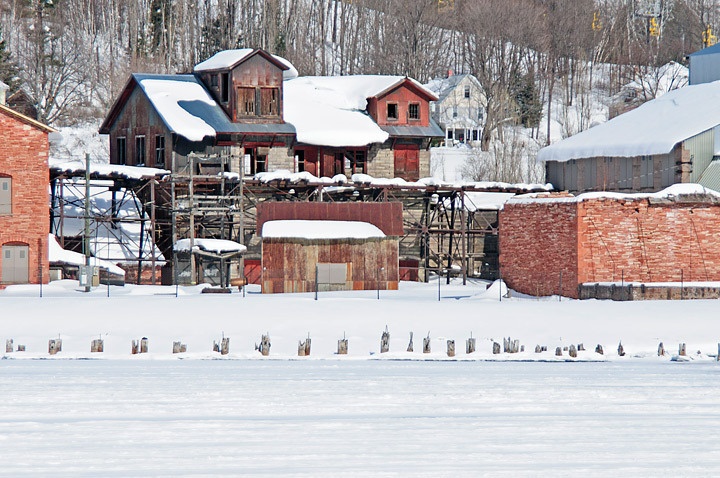 A few weeks ago we drove through Houghton, Michigan on the way to Calumet. I wanted to stop and see what, if anything, had changed with the Quincy Smelter in the past year. 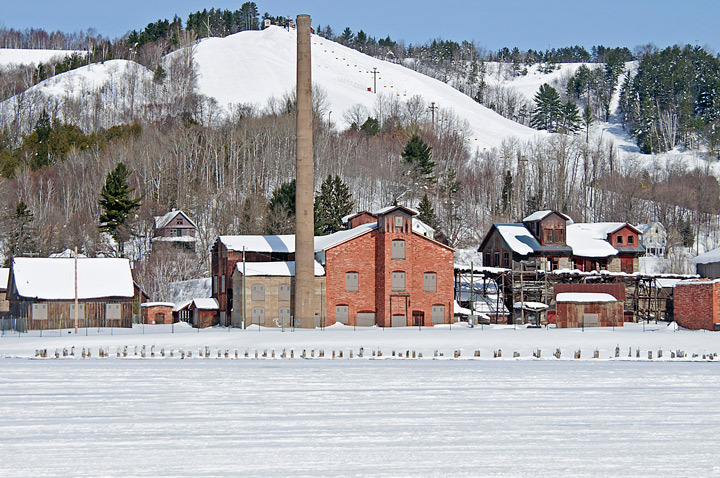 The Quincy Smelter looked like a bunch of old dilapidated buildings for most of the time I have been going to Houghton. A save the Quincy Smelter group was formed and now the National Park Service and the EPA are involved in the clean-up. The last I heard the plan was to move the NPS offices to the area once the environment has been deemed safe and the buildings can be rebuilt. 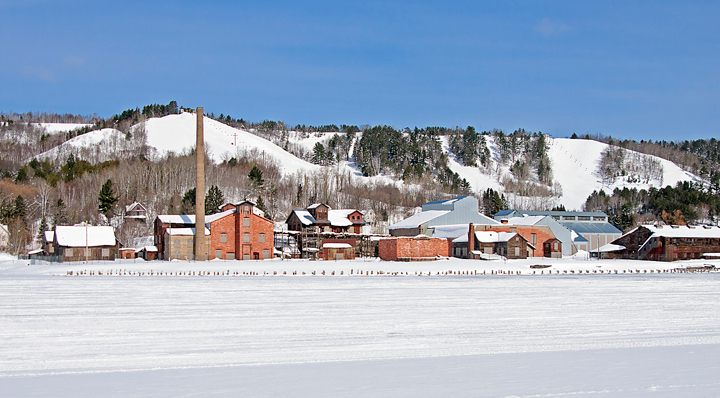 More photos of the Quincy Smelter can be found on my website. In my way of thinking winter is all too short. The first hint of spring is when we typically take our last ski trip of the season. This also a time when we take in our last sled dog race of the season. We travel to Calumet, Michigan the first weekend of march to ski at the Swedetown Ski Trails and take in the CopperDog 150 Sled Dog Race. This year is going to be a little different. 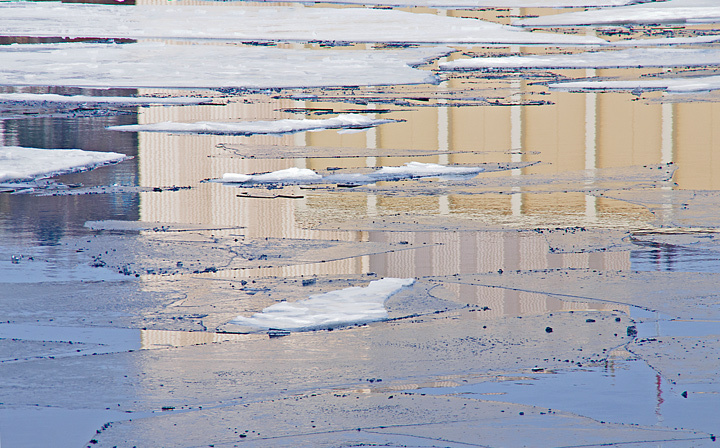 It was below zero this morning, the coldest start to spring in fifty years. Last year on this day it was eighty degrees. 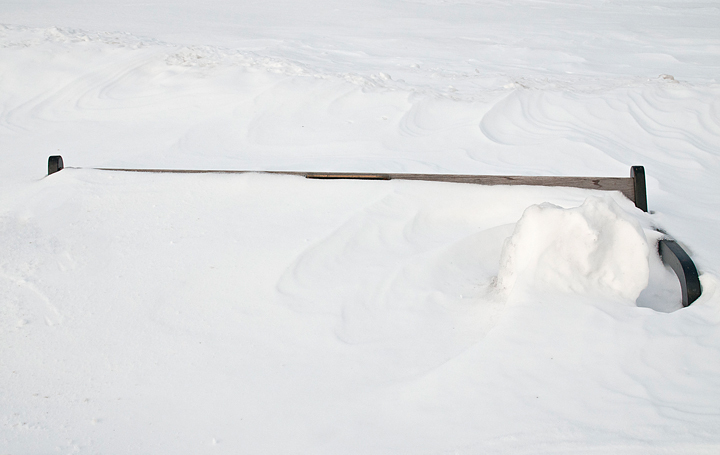 We have been battered by one snow storm after another with more on the way. What a great winter! It looks like it last at least another week so there will one more ski trip. Shortly after ski season I start to see the waterfalls that have been encased in ice most of the winter start to thaw and gradually the ice gives way to raging waters as the weather warms and the spring melt occurs. 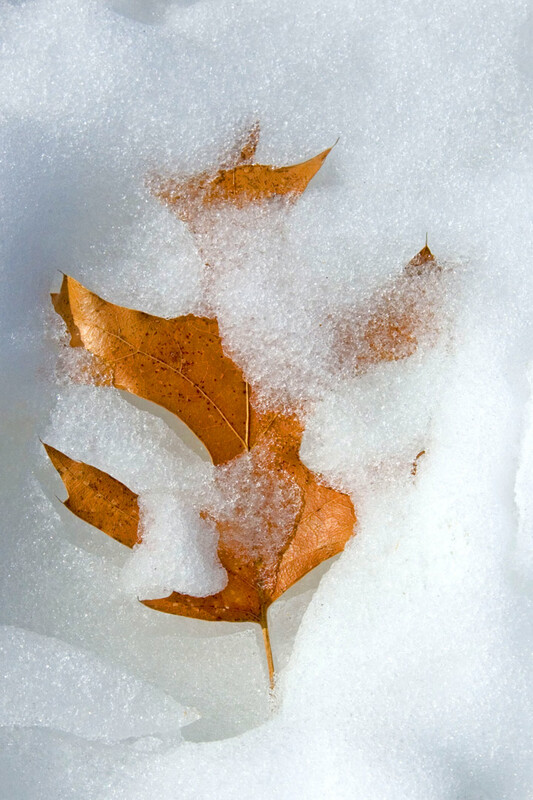 The few leaves from last fall that are falling onto the snow start to melt into the snow in the woods and trails around the area. Shortly thereafter, the first flower of spring starts to poke through the snow and mud. 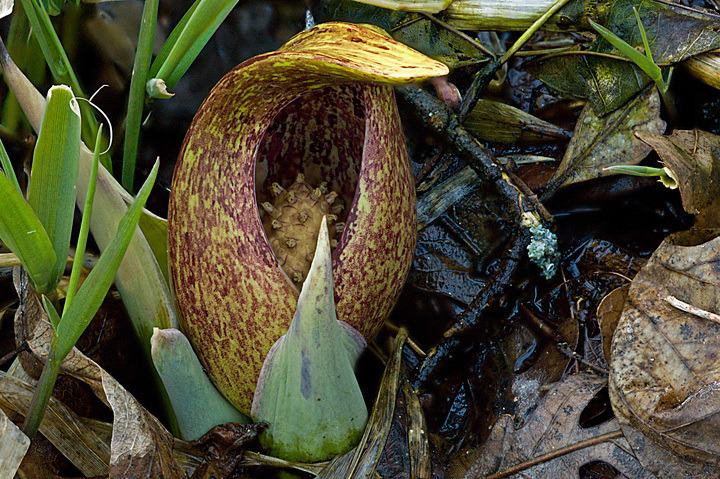 This is the often overlooked Skunk Cabbage which grows in wet areas along the Red Cedar State Trail. The Canadian Geese return to Hoffman Hills. 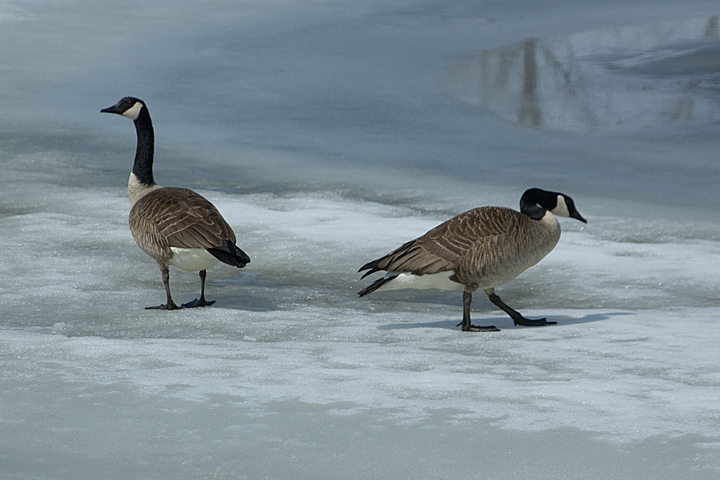 This pair arrived a little early and were having problem navigating the ice on the pond. One year a late March snowstorm caught everyone off guard and I found a goose egg laid in the snow along one of the ponds. 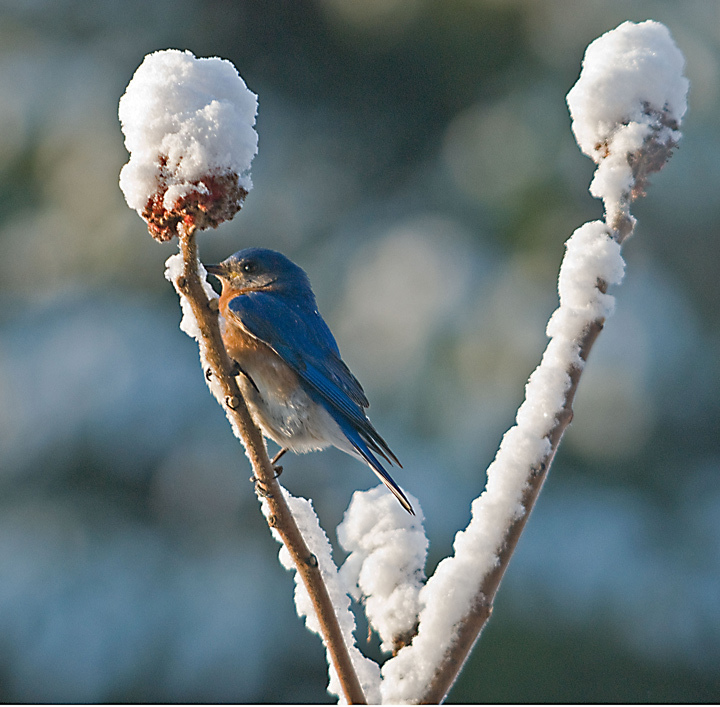 Spring is surly here to stay once the Easter Bluebirds return. 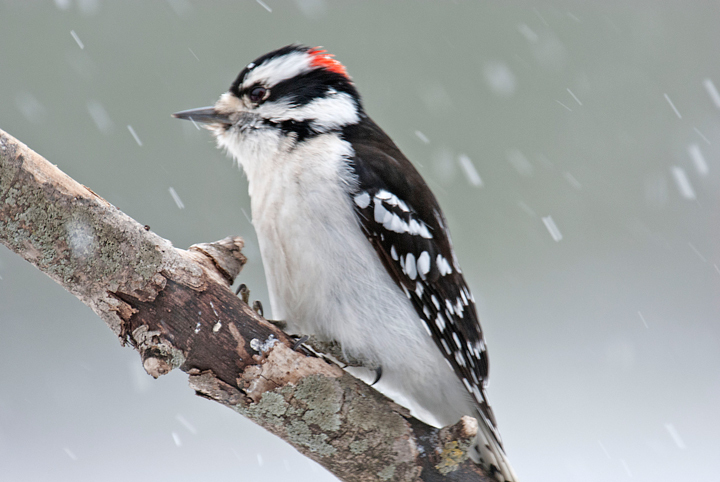 Sometimes they are a little early and get caught in a late season snowstorm but they are the first of the summer birds to return. 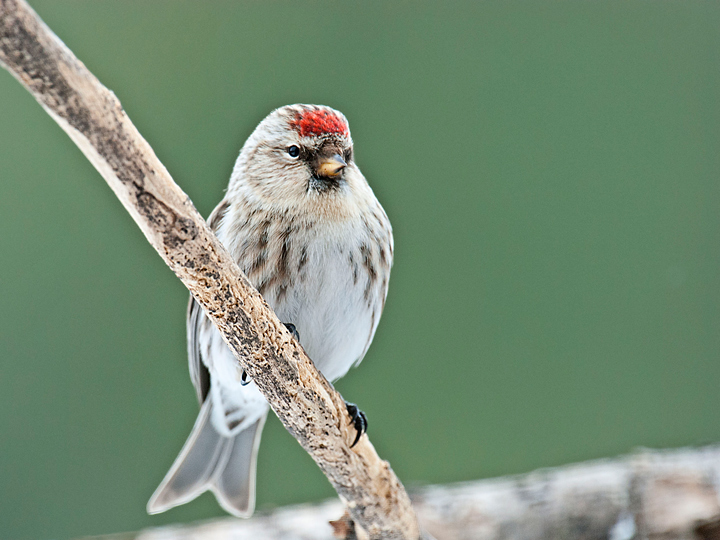 In an earlier blog I mentioned that I had a number of Common Redpolls hanging around my feeders. This was a fairly rare event since I don’t have any photos from earlier years. I also have a large number of American Goldfinches frequenting my feeder year around. A few weeks ago the Goldfinches and the Redpolls disappeared for over a week. One morning I looked out at my feeders and they were overrun with redpolls and goldfinches.. I’ve had a thistle feeder out all winter and had never had to refill it. 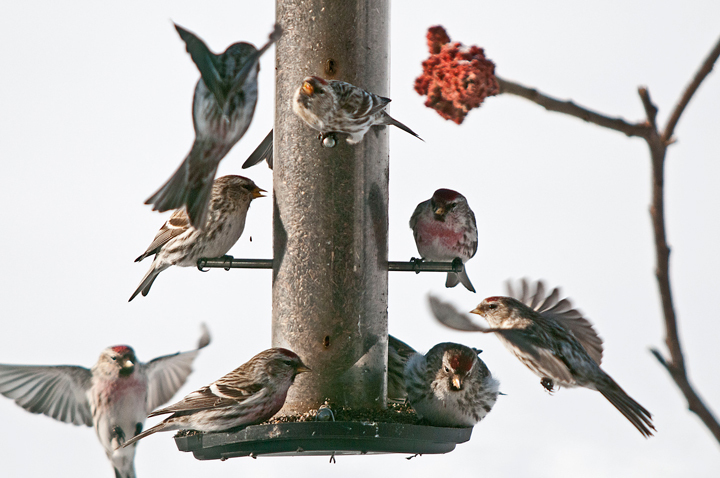 All of a sudden the redpolls couldn’t get enough thistle seeds and I was filling the thistle feeder every other day. 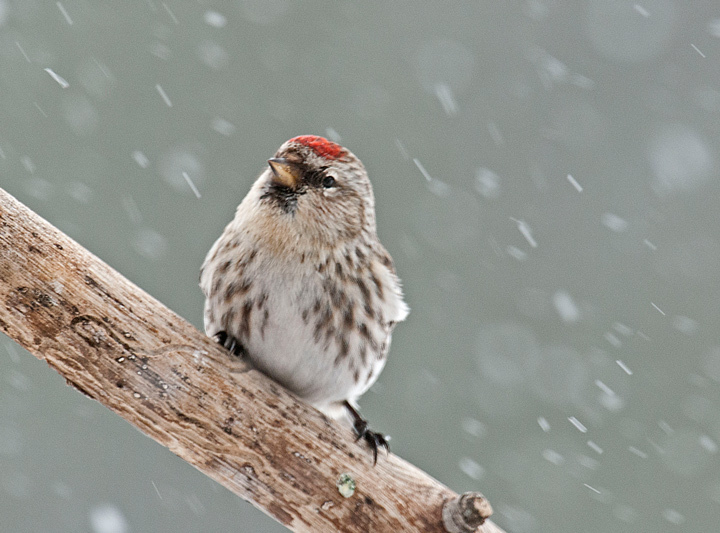 After a few weeks things quieted down but there are still a fair number of redpolls visiting the feeders.